Vasari Singers’ are delighted to announce that the second release on their own Vasari Media label is a work which has been close to the singers’ hearts, as well as to that of Jeremy Backhouse, their conductor, for many years. 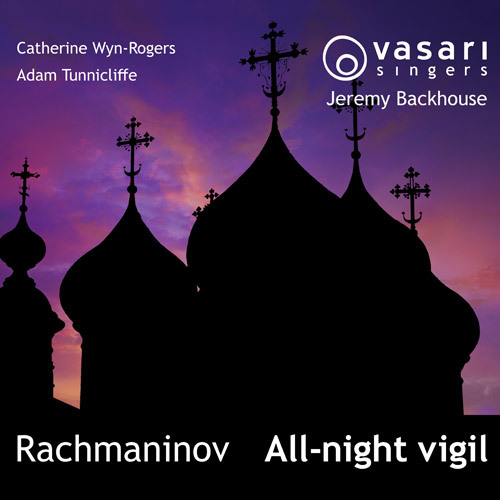 The All-night Vigil, also known as the Vespers, is Rachmaninov’s setting of the Russian Orthodox Church’s ancient format of sung psalms and prayers. It takes the worshiper from dusk to dawn, and transports the listener with its tapestry of rich and wide harmonies, dense textures and phenomenal bass notes, all woven together to form a work of almost unparalleled atmosphere. The choir is joined on this recording by soloists Catherine Wyn-Rogers and Adam Tunnicliffe.